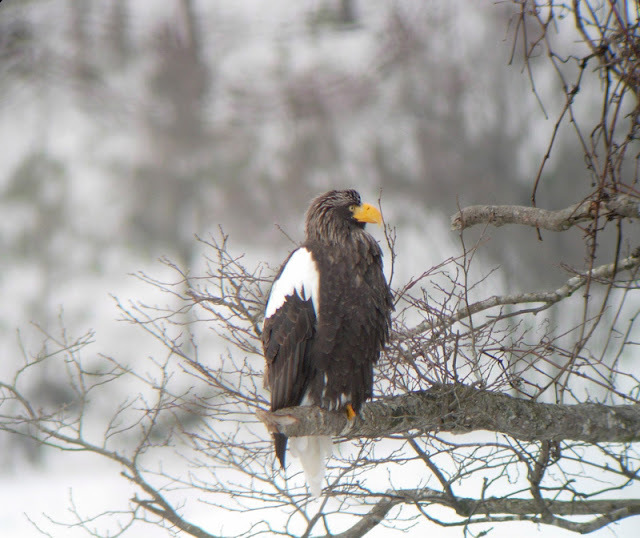 I took lots of shots of this Stellers Sea Eagle in Yakumo today. 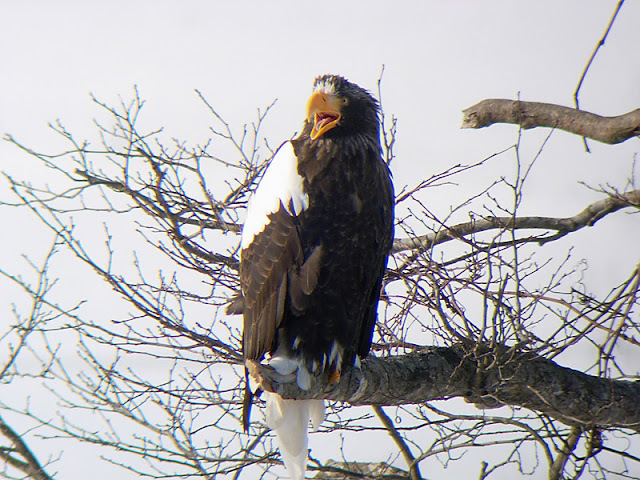 A nice unobstructed view and a not so shy adult to boot. Very mild weather today (with some rain mixed in with the snow-unusual in winter here). The place where we parked the car was thawing slush about 4 cm deep. I actually took over 200 shots. They were difficult to sort through as basically they were all fairly similar quality-wise. This was probably the best. Maybe. The bird stayed on its perch over an hour before it flew down to the river to scavenge a dead Salmon. It chased away the local Crows but somewhat surprisingly was chased off by a White Tailed Eagle. Are White Taileds dominant? 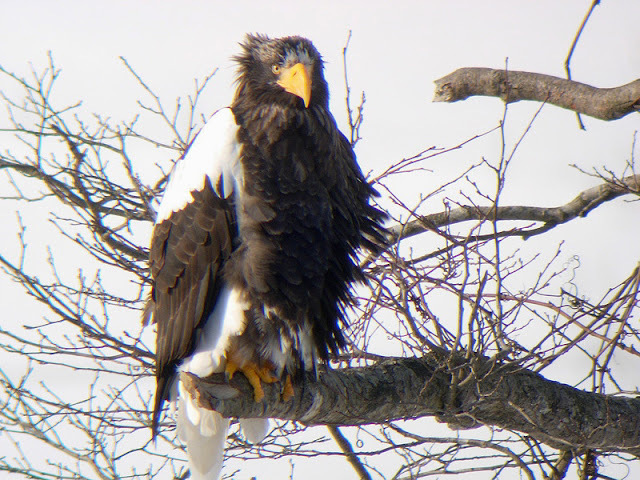 Sorry if you're bored with alll the Eagle pics. Here's the last one. I have 200 on my computer. I concentrated on the Eagles today. A quick look on the sea when we were driving up revealed the usual Ducks and stuff on the sea (the most interesting looking flocks being in places where we couldn't park). 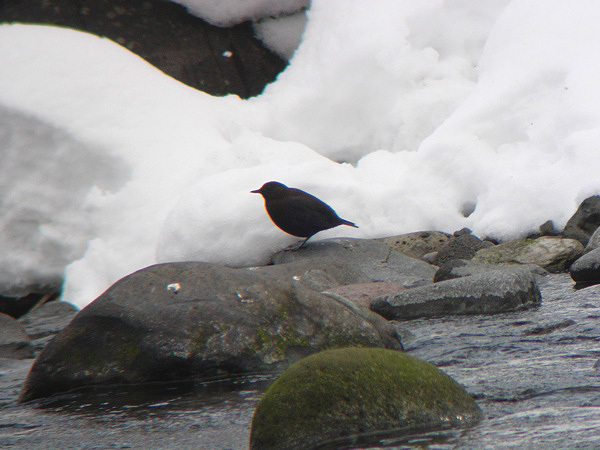 At the Eagle location I took this pic of a Brown Dipper. 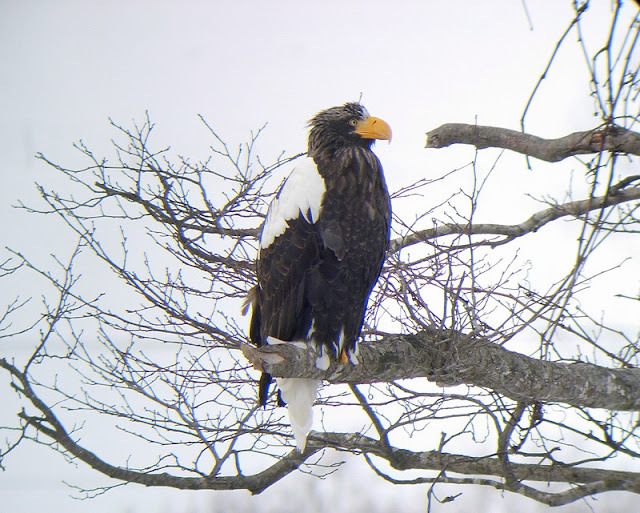 It seems a bit pathetic compared to the Eagles (the pic, not the bird). I took a brief walk near my appartment yesterday and was rewarded with a flock of Bullfinch. 6 or 7 individuals. A handful of Waxwing were still about too. On Monday we drove east to Menagawa to check the Cormorants. 2 species here-Temincks and Pelagic. 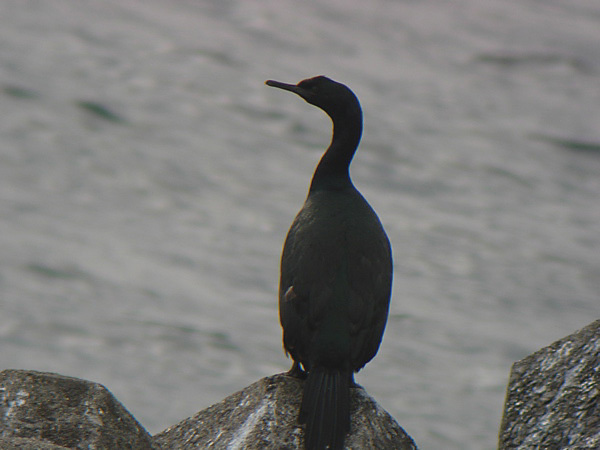 The Temincks is very similar to the bog-standard Great Cormorant (the same one as in the UK) but is supposed to have a greenish tinge instead of a bronze tinge (if you're close enough to see this of course). Doesn't really help with the bird in the middle the pic below does it? 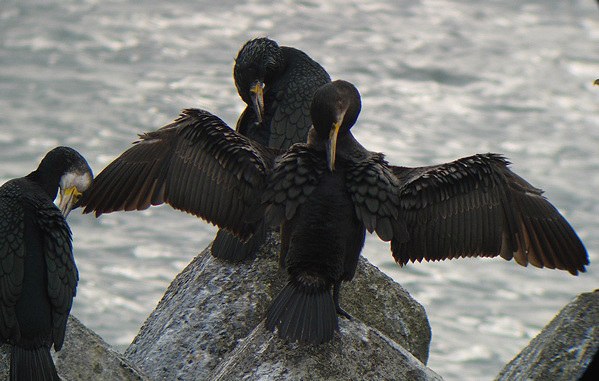 Great Cormorants are supposed to favour rivers/lakes and Temincks the coast. I see Cormorants on lake Onuma sometimes. Which ones are those? Just to confuse matters Great is supposed to be absent from Hokkaido anyway. Pelagics are much easier to identify. Other birds around near Menagawa included Japanese Wagtail, lots of Brent Goose, the usual Ducks and grebes and lots and lots of Gulls. 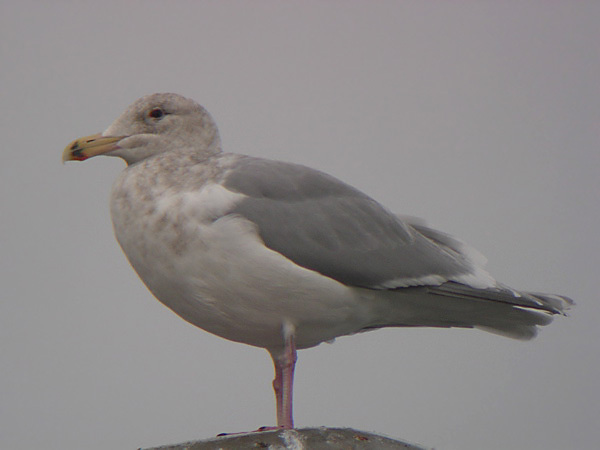 Here's an adult Glaucous Winged Gull. After the laughfest of Threads last weekend I now have Saw 3 and Children of Men on my hard drive to cheer me up. It's not as depressing as listening to the cricket though. Ouch.